Describes features and general specifications of the product. Gives information on how to install, handle, and operate the product. Explains how to troubleshoot problems. Provides step-by-step procedures for disassembling the product. Describes routine maintenance procedures, such as lubrication, cleaning and etc. Provides a parts list, including information on screw types. Provides a list of tools required for servicing the product. Provides exploded diagrams and lubrication diagrams of the product. 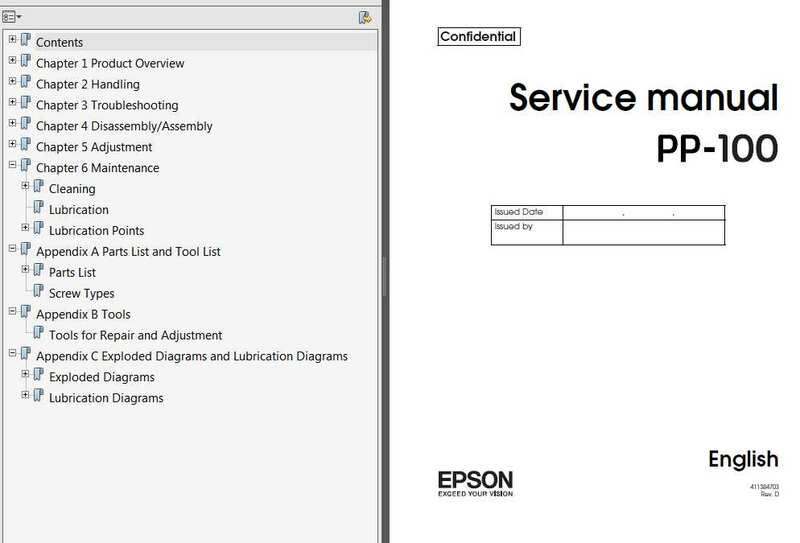 Need Full Epson PP-100 Service Manual and Parts List - Order Epson PP-100 Service Manual and Parts List If You have questions - we'll be happy to help you. Please contact us regarding Your Epson PP-100.